Equipment: Electric Fan. Television. DVD Player. Microwave. Coffee Maker. It has 2 bedrooms, the main one with a queen size bed and bathroom, with wide bathtub. Toilet in an independent room. Second bedroom located in mezzanine, with balcony to the kitchen area. It has a desk area and library. All the rooms are connected by a beautiful patio with plants and a table/chairs area. At very young age I created a web guide of San Telmo neighbor, being now the top web reference of the neighbor. With my team we will make sure your stay will be as pleasant as possible!!! muy buena experiencia, lindo lugar, cálido y céntrico. excelente los tres meses que viví ahí. We (my wife and me) had a very good month in Buenos Aires (Jan/Feb 2016). The apartment has some minor practical shortcommings (doors which are hard to unlock at times and a wobbly dining table, which we didn't use), but overall we liked staying in the place a lot. It contributed to our general positive feeling about BA. The apartment is part of an old, gradually decaying but charming building which we shared with some 15 to 20 local families. It is nicely decorated. The location is fine in all respects. 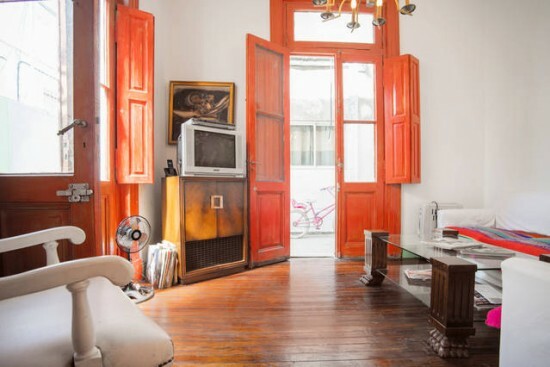 San Telmo is a good and pleasant place to stay. Mercedes and Santiago (Casa San Telmo) were most friendly and very helpful in their own personal way. Tuvimos una buenísima estadía, todo impecable, el departamento muy agradable, luminoso, buenos espacios, buena temperatura. Muy bien ubicado! Totalmente recomendable! The apartment is convenient and the location is good not for from subway and buses stations. 2 bathrooms. 1 separate bedroom. The only negative point is the cleanliness which could have been better. Very nice apartment, pleasant ambience, all available required; the oldbuilding flair is beautiful; very friendly and circumspect team; good central location. We had a pleasant stay during the 3 week period in the apartment we rented at Carlos Calvo. Some minor inconvenience such as no electricity for few hours one day and jo water half of the day and through the night . Owner gave us a warm welcome and invited us to places for our tango experience. I highly recommend their place.